by Assyrian International News Agency (AINA), July 30, 2001. AINA - On March 29, 2001, Ms. Khawa Warda, an Assyrian American from Chicago, arrived at the Iraqi-Turkish border en route to her family home in Ber Seve near Zakho, northern Iraq. Following a grueling overland journey to the Iraqi border where they were met with checkpoints, automatic weapons, and suspicious Kurdish and Turkish border police, Khawa was finally warmly greeted by friends and family. Assyrians throughout northern Iraq had just gathered to celebrate the 6751st Akitu Festival of the Assyrian New Year once again marking Assyrian ties to the historic heartland of Assyria. The Warda family spirits were still more heightened in anticipation of the upcoming April 17th wedding of Khawa's brother, Youkhana. Youkhana Yalda Khaie, Khawa's brother, was a 32 year old self-described Assyrian from the Chaldean community who had made his home in Chilke Nisar. Youkhana was a hardworking farmer who labored on a large tract of land that he owned. The young Assyrian was also a well known activist and had been interested in raising funds to rebuild the ancient Church of Mar Moshe in his family's home village of Chilke Nisar which had been razed by government forces in June, 1979. Unfortunately, though, the combination of Youkhana's activism and extensive land holdings earned him the envy of the Behdanani Kurdish tribesmen near his home and therefore made him the target of the mostly Behdanani Kurdistan Democratic Party (KDP). On April 5, Youkhana was deceptively lured to the village of Kane Misy by KDP agents with the promise of donating supplies for the new Mar Moshe Church. Upon his arrival to Kane Misy, Youkhana was apprehended and subsequently disappeared. In a frantic search throughout the region, Khawa was unable to locate Youkhana until inquiries by United Nations (UN) personnel revealed Youkhana had been held in solitary confinement in a KDP political office. Later, Youkhana was moved to Fermandy Prison in Duhok. He was not allowed any visitors for more than two weeks including by his fiancé until Khawa was able to bribe a prison official for two visits on April 20 and May 20. During these visits, Khawa discovered that Youkhana had been severely whipped in the face and legs with a wire cable by two KDP agents. The beatings had left Youkhana badly scarred and unable to stand or walk. He was kept in isolation in a small cell while blindfolded with his hands tied- his only visitors being those KDP guards intent solely on further mocking and taunting him. The extent of his beatings was so profound and disfiguring that Youkhana was removed from the prison for four days during an inspection by the International Committee of the Red Cross (ICRC) so that the extent of his torture would not be discovered. During Khawa's visits with Youkhana, KDP prison guards repeatedly threatened the Khaie family that any complaints about Youkhana's torture to the UN or ICRC would result in still greater pain and cruelty for Youkhana and his family. Till this day, Youkhana has not been charged with any crime nor has he had access to an attorney or visitors outside of family members willing to bribe prison guards. No court date has been set and no end to his daily torture and imprisonment is in sight. Youkhana remains in prison in imminent fear of death. Throughout his interrogations and torture sessions, Youkhana was repeatedly asked to confess his ties to the Kurdistan Worker's Party (PKK), the predominantly Behdanani KDP's Kurmanji paramilitary rival organization. Youkhana and his family have vehemently denied any previous or current ties to the PKK and the KDP has provided no evidence or formal hearing on the matter. The predominantly Behdanani tribes of the KDP have conveniently used their blood feud with the Kurmanji tribes of the PKK to target Assyrian civilians literally caught in the crossfire. For its part, the PKK as it had similarly systematically done in southern Turkey, often enters an Assyrian village under cover of night and demands assistance by threat of arms. Fearing violent reprisals, unarmed Assyrian villagers are unable to refuse. Those villagers acquiescing to PKK demands then find themselves suffering violent attacks by KDP thugs the following day. 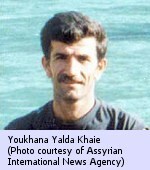 The very same script was played out in the KDP attacks against the Nahla Assyrian villages (AINA 1-21-2000). As a result of an international Assyrian outcry against the KDP paramilitary raids, the KDP egregiously threatened the Assyrian village leaders into signing a letter denying that the raids ever occurred. The KDP was humiliated when their crude scheme was exposed by confirmation of the attacks by UN and ICRC reports. The underlying motivation of this KDP policy is to heighten fear and intimidation of Assyrians so that they abandon Assyrian lands. Till now, the Assyrian villages in the Nahla area remain under virtual siege with heightened tension. Not surprisingly, the motivation behind Youkhana's ongoing torture is believed to be based on driving him off his land. In a formal statement to Amnesty International, Khawa Warda asserted that the primary reason for her brother's arrest and torture was that "They are trying to take his land away from him." The totality of the savagery of the ongoing torture of Youkhana is believed to be carried out by the security forces of the KDP- the Rekkhistine Taybeti- under direct instruction from the leadership. The Rekkhistine is believed to be headed by Nerjewan Barzani, the nephew of KDP strongman, Masoud Barzani. In their 1995 report on the human rights situation in northern Iraq, Amnesty International concluded that "The security apparatus of the KDP, Rekkhistine Taybeti, and that of the PUK (Patriotic Union of Kurdistan), Dezgay Zanyari, are said to have units akin to assassination squads, whose members receive orders from senior party officials. There is also widespread conviction that such unlawful and deliberate killings could not have been perpetrated without the knowledge, consent or acquiescence of the leaders of these two parties, to whom the security and intelligence apparatuses are ultimately responsible." Assyrians with political roots in northern Iraq have insisted all along that torture and assassinations are used as deliberate instruments of policy by the Barzani clan occupying parts of northern Iraq. Assyrian villagers are purposely targeted in an effort to ethnically cleanse the region of its indigenous Assyrian inhabitants in order to further consolidate the KDP paramilitary occupation of Assyrian lands. Regrettably, rather than having gained a greater appreciation for the intrinsic value of respecting human rights and appreciating diversity following their alleged victimization by the government of Iraq, the occupying paramilitary Behdanani forces now in northern Iraq have instead turned doubly savage towards the indigenous Assyrian population.